I wasn’t necessarily expecting another book in this series so it was a nice surprise to see it pop up on my Goodreads list of ‘books released by authors you’ve read’. Since i had no expectations of this story, i was looking forward to the read, but i have to say that it wasn’t as quick of a read as the others in the series. This story focuses on Jon a bit more than the others ever did – where we get to see him as a teen who’s got this odd sense of entitlement while he’s still quite fearful of a mis-step that will get him kicked out of the enclave since they are only living there on slips / passes. The basis of this story is showing that there’s real inequality and that the only people that are ok with it of course are the ones that ‘have’ things of value. I think that one of the things that we know of society is that the folks that don’t have ‘things’ are the ones that usually decide for themselves to make a change. Jon isn’t quite ready to settle for what the situation of things are, yet he’s afraid of the consequences of his actions. His brother Matt and sister-in-law Syl live outside of this specific type of community form, and that’s something that over the course of the story we see become more attractive and necessary for all the folks involved. Through a series of unfortunate events of deaths, and lies, the family has to find a way to leave the enclave of Sexton and find their way to something better. 1) is what’s outside of Sexton better? 2) is there even something outside of Sexton? While i like the idea of where this story is going, i don’t know what’s really next. Where we’re left off in this 4th installment leaves a clear direction for the immediate next few chapters, but besides that, i don’t know how much farther they can take the story. We’ve seen things happen that you can only expect from a desperate time/society, and you see definite character maturation and growth, but aside from that, i’m not quite sure what my expectations are for the future of the series. Maybe that’s a good thing though – not to expect where the story will take us – definitely something to think about, so i’ll keep my eyes open for a book 5 in case one comes out in the near future. 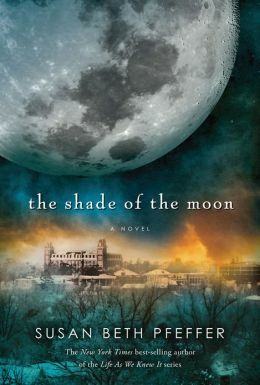 This entry was posted in Dystopian, Reviews and tagged Dystopian, Life as we Knew It, Shade of the Moon, Susan Beth Pfeffer by iscm13. Bookmark the permalink.